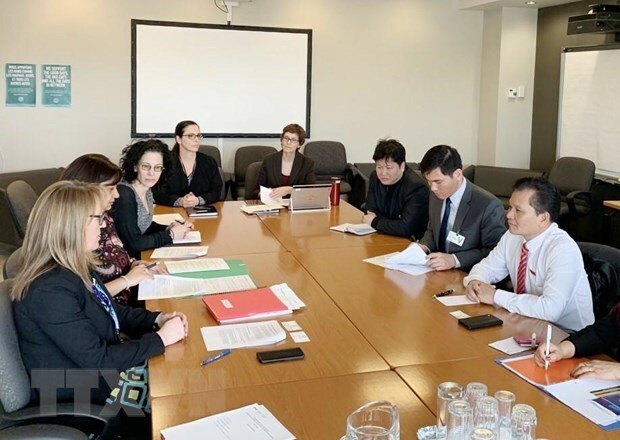 Hanoi (VNA) – A delegation of the National Assembly Committee for Social Affairs, led by its deputy head Bui Sy Loi, has visited Canada to exchange experience in policy and law building regarding labour, health and gender equality issues. During the trip, which lasted from April 1 – 4, the delegation paid a courtesy call to Francois Paradis, President of the National Assembly of Quebec. It also worked with parliamentary agencies, departments and sectors of the eastern Canadian province to learn about local social welfare policies. The meetings focused on the research and development of labour standards and relationships to meet requirements of the Comprehensive and Progressive Agreement for Trans-Pacific Partnership (CPTPP) and capitalise on opportunities brought by the deal. The making of the local laws on labour standards, labour contracts and equal pay, among others, as well as the sides’ experience on public feedback collection in legal building were discussed. The trip aimed to help Vietnam’s efforts to revise its Labour Code and complete policies, plans and actions programmes on health and gender equality. Later, the delegation was received by Senator Raynell Andreychuk, Chair of the Canadian Standing Senate Committee on Foreign Affairs and International Trade.